We didn’t post a blog last week because I (Andrea) was sick with the stomach flu…and what a flu that was! The entire family, starting with the teenagers, went down within a matter of five days. That’s how contagious it is. In fact, our family doctor, when informed that the teenagers were both sick, predicted that Brad and I would also get it. I thought he was joking. After all, we’re both dedicated hand washers and we both got the flu shot but he was right: it was not enough to stop this particular strain. When flu season begins, it’s always in the back of our minds with the Kindergarten. Because we share all school supplies and learning resources, from pencils to crayons to puzzles to the individual write boards, we are well aware of how quickly germs can spread in the classroom, and then to students’ families and beyond. There are lots of toddler and preschooler siblings, plus many grandparents in our school dropping off and picking up so we are well aware of the far-reaching impact the flu can have. 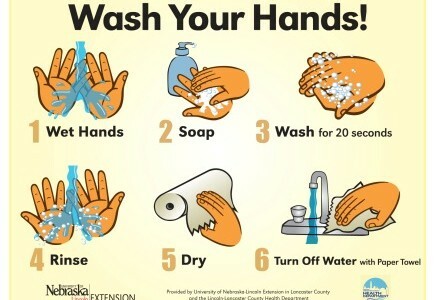 One of the most important things we can do to help prevent the spread of germs is to wash our hands. We’ve always been diligent about hand washing, trying to find the balance between common sense hygiene and borderline fanaticism. We don’t wish to appear as germophobes, nor do we want to create a sense of anxiety around it for the students. So we’ve created routines around hand washing in class, before we eat at snack and lunch, always after using the bathrooms, and after nose blowing. Thank you to all the parents in our classes who have been teaching their child to independently wipe, or blow, his or her nose. If the children forget to cough in their elbow and cough into their hands instead, we’re also asking them to wash their hands. As the adults in our children’s lives, it’s important for us to teach and re-teach, model and follow through on good hand washing etiquette ourselves. To learn more on protecting yourself and your family to stay healthy, please visit the Vancouver Coastal Health website at vch.ca. Upon my return to the classroom, we had a little discussion about why, when I was sick, did I stay at home instead of coming to school, even though I really missed the class. The children knew right away that I wasn’t feeling well so that’s why I stayed at home, but some of them also understood that I did not want any of them, or their family, to get sick. By staying home and getting better, so I felt healthy and had the energy and stamina to be teaching all day, to be able to calmly and patiently deal with any problems, meant that when I was back in the classroom we would all enjoy ourselves. Last year Christy and I wrote a very popular post, “Your Kindergarten Child’s Good Health,” that we’re reblogging here today. 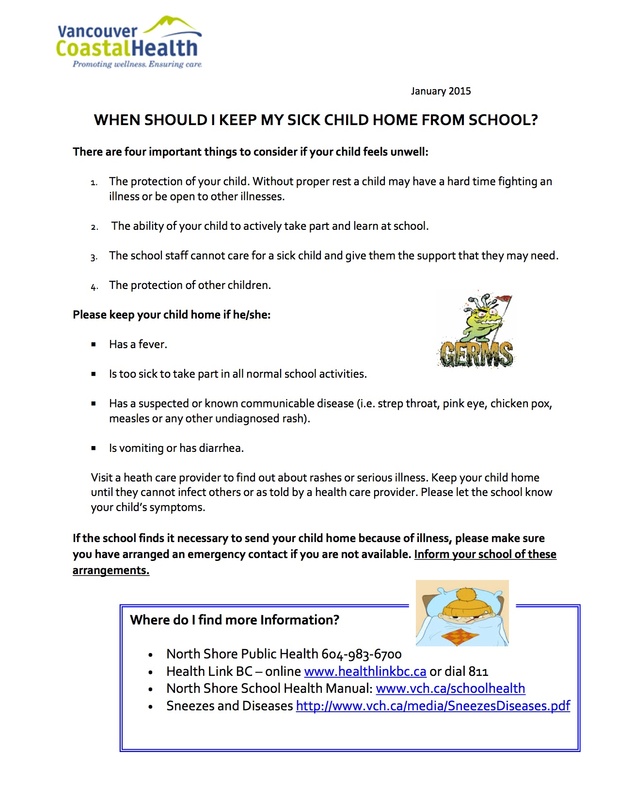 If your child is sick, please keep your child at home until they are feeling strong enough to cope with the full school day. Whether teacher or student, coming to school healthy is for the mutual benefit of us all. We have worked hard at reminding your children to wash their hands after blowing their nose, using the bathroom and before eating, but Kindergarten children are five years old and cannot possibly remember every instruction every time. We appreciate your support in reminding your child about these good habits when at home and school. With our return to school, and the advent of flu season upon us, we thought it would be a good time to talk about when your Kindergarten child is sick. Every year we are informed by parents at drop-off time that their child has “a little cough,” “a little fever” or “a bit of a runny nose” but is still well enough to come to school. When a child is sick, as parents we have a responsibility to not only to care for our child but we also have a responsibility to the classroom and school communities. A sick child should stay at home, for the mutual benefit of the child, the classroom students and teaching staff. 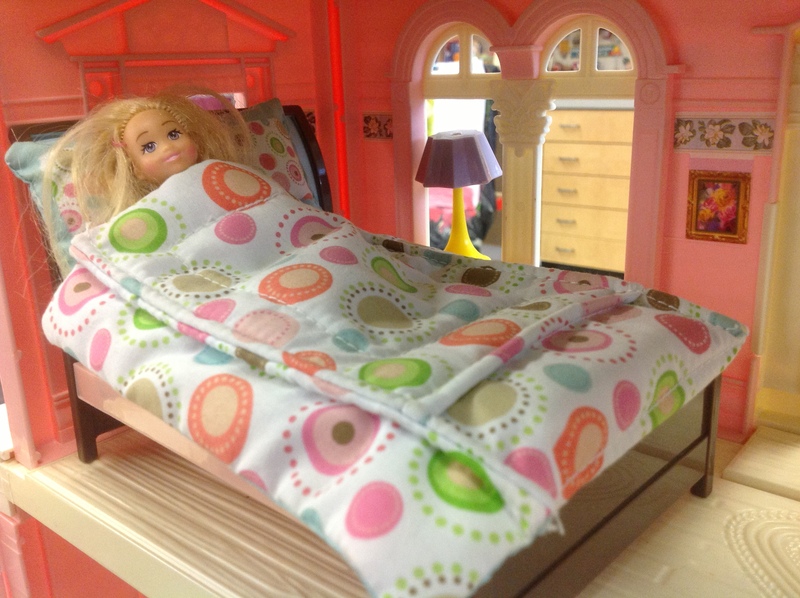 It is good parenting to decide that your child should rest and recover quietly in bed. A child who is given one, two or even three days, to stay at home will get better faster, and be stronger and more able to fight the next cold or illness in the classroom. We realize as working parents ourselves that it is not always convenient to have your sick child stay at home, as it means taking a day off, or more, from work. However, there are many implications of having a sick child at school. A sick Kindergarten child often feels fragile, prone to tears and wanting his or her parents. Sending your children to school sick and feeling poorly sets them up for failure, not success. When the children are sick, they do not have the energy to focus on the lessons of the day. It is very difficult for them to self-regulate their emotions in the classroom context. They lack the patience, because they do not feel well, to cope with challenging schoolwork, possible conflicts with their friends and making good choices.